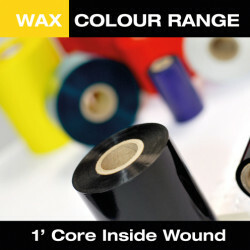 A whole range of Armor colours has been developed on the basis of our current wax/resin and pure resin qualities, to suit a number of automatic identification and graphic applications, with similar printing performance than their equivalent black ribbons. 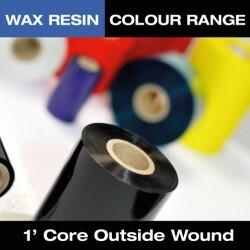 Available in several widths, various grades - Wax, Wax Resin and Resin Grades on 1" Cores, in 300M lengths, with options of Inside or Outside Wound depending on the printer. 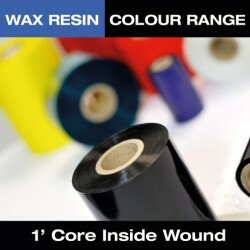 Coloured Wax Resin - Ideal for printing on Semi-Gloss Paper / Tag /Ticket Stock and Synthetics. Ribbon gives good level of smudge, scratch and heat resistance. Excellent printing quality for all types of barcodes, very small text, large characters and logos. Coloured Resin - Recommended for printing on Synthetic's (polyester, polypropylene, vinyl’s etc.). This Resin ribbon gives excellent print quality and durability for labels that require resistance against extreme temperatures and against certain solvents.